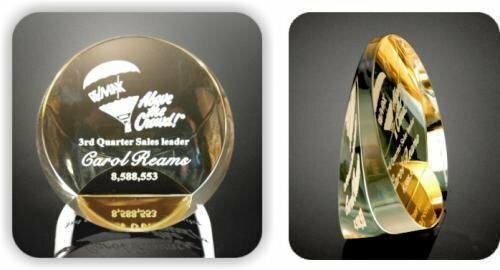 The Wedge Paper Weight acrylic award is the perfect size desk paper weight! It features a beautiful angled taper and stunning gold tone mirror bottom. 4" in diameter x 2" thick at the bottom tapering to -1/2" thick at the top. These stackable hexagon shaped paper weights acrylic awards are crafted from the finest acrylic and polished by hand to perfection. 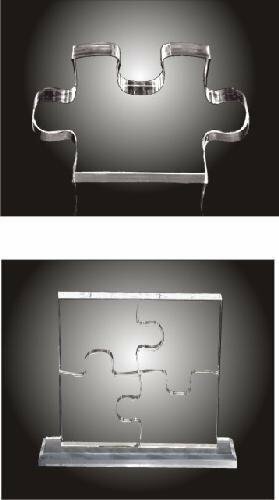 Their simple yet elegant shape and design provide endless possibilities and prove their versatility as an award for any commemorative achievement. Available in your choice of blue, red, green, gold or purple reflective bottoms!